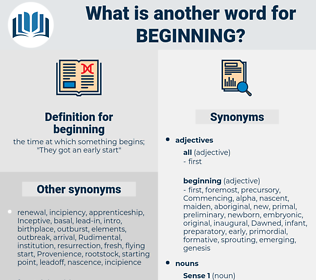 What is another word for beginning? dawn, introduction, inauguration, prelude, emergence. Began, Commencing, members, beginner, Begun, early. launching, Began, Commencing, principles, launch, departure, dawning, startup, Booting, starting-point, beginningof, advent, infancy, boot, novice, beginner, get-go, establishment, opening-up. Embarked, erupted, initiated, Commencing, start. being, Embarking, coinciding, Involving, Guidelines, triggering, ongoing, Originating, implementing, initializing, preliminary, Terminating, entering, Introducing, ieaving, Including, convening, Considering, Mentioning, restarting, burgeoning, expiring, continuing, Establishing, i.e., preceding, underlying, Attaining, conducting, determining, Instituting, responses, Undergoing, ranging, moving, sending, departing, appearing, Excluding, register, Registering, Extending, provoking, Utilizing, Addressing, smiling, urging, change, namely, emerging, losing, happening, exiting, Committing, forging, Receiving, leading, assuming, answers, speaking, traveling, support, supporting, lagging, laughing, telling, resulting, shaping, standing, cover, covering, Spanning, developing, Having, working, performing, causing, staring, cases, taking, Relying, exporting, Carrying, reaching, Adopting, Attempting, falling, Totalling, Stating, running, according, rolling, putting, accounting, talking, looking, playing, showing, paving, getting, trying, 1995, launching, Commencing, making, Doing, principles, starting, dawning, Booting, boot. following, terminus, achievement, intent, limit, bound, complex, close, Evolved, extensive, expiration, desist, break off, detailed, subsequent, convoluted, uttermost, result, consequence, higher, utmost, after, boundary, quit, cessation, conclude, completion, complicated, terminate, intricate, expire, design, stop, behind, issue, purpose, elaborate, effect, sophisticated, goal, advanced, point, extremity, fulfilment, cease, complete, developed, finis, high, tip, extent, outcome, refined, accomplishment. death, finale, termination, consummation, finish, epilogue, conclusion. It just happened to make a good beginning, you see. His wife says that in the beginning of those days he used to come to her and wonder what could be the matter with him. big science, bignoniaceae, bookishness, bugginess, booking, baseness, besieging, boozing, boyishness, business, beseeching, bivouacking, backing, bagging, bigness, Bobby Jones, baking, B. B. King, by chance, busyness, bioscience, buxomness, bushwhacking, boxing, buzzing, begoniaceae, bignoniaceous, becoming, basenji, biogenic, bigamous, Begging, bog moss, bechance, beijing, biogenous, biogenesis, buckskins, bushing. casus belli, creation, ground floor, start, growth, origin, conception, egress, inception, origination, emergence, issue, generation, outgrowth, genesis.